It has sweetened red bean paste inside. Many years ago, Koreans believed red beans in food (especially in rice cakes) drives out the devil spirit, so they used it on a baby’s first birthday to wish them long life and health. please can you drop the recipes? Do you mean share the recipe? Sorry, I don’t have it yet, but it’s already on my to do list. Stay tuned! My kids love red bean filling. It’s probably a a good idea to make some for their school snack. do you kno d different flavors they have of gyundan? I kno there is mugwort (green), but what are the red and white ones? 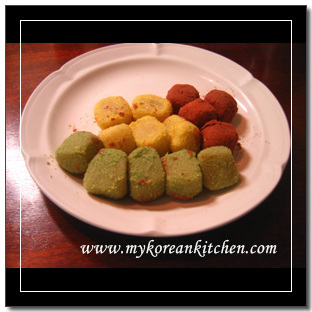 i would like know what make the rice cake tricolor….i have tried is very good i m like to much! the name of them is raimbow. is possible receive the receipt of them. would you happen to have a recipe for this dish? i love it so much i was hoping to find a recipe for it! awww that looks so dammmmm good. i just had it last night cuz i’m korean. it’s soo goodd.